Tiger Woods Ready to Win at Least Three Golf Tournaments in 2012? Tiger Woods kicks off his 2012 PGA Tour season this week at The AT&T Pebble Beach National Pro-Am. Woods has been working hard on a new swing with coach Sean Foley and his mental game is also looking sharp, leading one expert to predict that Tiger will win at least three times on tour this year. Steve Siebold, a former professional athlete (tennis player), mental toughness coach and author of the book 177 Mental Toughness Secrets of The World Class, has worked with athletes for twenty-seven years and has been pointing to a Tiger Woods comeback all along, but based on what’s he’s seeing now he believes this is the year of the Tiger. · Tiger Woods' talent never left him; it was his confidence that disappeared. Now that he knows how to win again, he’s not going to stop. Tiger won his last PGA Tour start, The Chevron World Challenge on December 4th and finished third at the Abu Dhabi HSBC Golf Championship. His confidence is as high as it’s been in years. In his first round of the ATT at Spyglass Hill Golf course, Woods fired off six birdies for an opening round of 68, hitting eleven of fourteen fairways and fifteen of eighteen greens in regulation. · His ball control is much better than it’s been, and he’s working the ball left to right and right to left comfortably. Both physically and mentally he looks really healthy and his competition should be scared. He’s going to win at least three times this season. 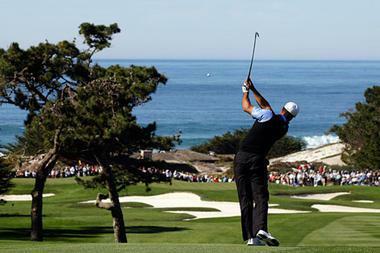 · Pebble Beach will be a good start for Tiger. He won the 2000 U.S. Open at Pebble Beach by fifteen shots. He knows how to win big on this track. · Woods has made adversity his mental training ground. The stress and struggles of the past few years have only made him that much tougher and he’s ready to dominate the game again. · Woods is hard-wired through years of world-class programming to focus on a vision and persevere at any cost. He doesn’t understand what giving up is. · Champions like Woods are professional failures. They know that success is based on a series of comebacks, and that setbacks are set-ups for comebacks. The bottom line for Siebold? A bet against a champion like Tiger Woods is a bad bet. On the physical plane he has perseverance, on the mental plane he has toughness and on the spiritual plane he has artistry...so says Siebold. Voice your opinion on Twitter @Golf4Beginners and friend on Facebook. Olazabal With a Chance to Win The Masters? You Bet!